Since last week, and after several posts I’ve written (check them out here and here), I’ve been doing quite a lot of thinking on what feminists really mean to me. So hey, why not make my first Slam Sundays back ALLLLLL about feminists? Ok, so this first one, I think, kinda illustrates exactly what drives the feminazi to her extremes. Her original commitment to feminism wasn’t all about nitpicking and taking offense to clearly inoffensive things, or calling “misogyny!” on anything that has anything to do with women, unless a feminist said it. No. However, this satyric Slam Poem may help you understand the f&$#*# up thinking and rationale that can be encountered after claiming “feminist”, and why their back is up and they feel the need to war, fight, and defend every moment of every woman’s existence…even when, upon some time and rational thought, they’d probably realize that some of those wars really have nothing to do with their cause. Like how the weapons of mass destruction search really had nothing to do with anything but hijacking some oil. is what I like to call feminazi garbage mixed with some kernels of truth, so that the actual jackassery, insult, and counterproductive (and counter-cause) thinking is almost completely missed. Notice how completely ignorant and prejudiced this woman is against anyone who refuses to wanna be just like her? To start your argument off by calling anyone who doesn’t want to label themselves a “feminist” a baby, by telling them that, before even getting their answer as to why, that they sound stupid, and then for actually moving forward to providing two examples of reasons why a silly woman would say she’s not a feminist, as though those are the only possible reasons…there is just SO many things wrong with that reasoning. 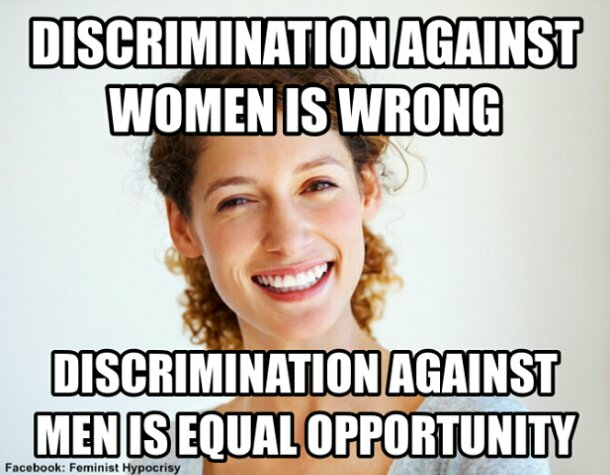 How hypocritical is it to debase women who don’t think like you, when your cause is equality? Or rather, when your cause is SUPPOSED to be equality? Seriously? I was actually terribly offended by this video and all of the attacks and fallacious reasoning that was used to try and support her point. Two wrongs don’t make a right: just because others put you down and try and minimize your struggle, fight, cause, intelligence, importance or meaning by mocking, hating on, or trivializing the things you say or do doesn’t make it acceptable for you to turn around and do the same to ANYONE else. You’re just a dirty hypocrite, and I hope one day you learn that. Now, here’s a feminist slam that I can get down with. In a couple minutes she makes her very valid point, and yet manages to do it without putting anyone else down, it’s a message of empowerment. And it’s powerful. Check it out. Anyway, hope y’all have a fantastic Sunday… Tune in next weekend for a “topic appropriate” Slam Sunday (think: religiousness, Classic Ruby stylez). Previous God, Please Let The PJ’s-in-Public Trend End!!! That first one really made me laugh cause some backward men are just so dumb like why? Oh and that second one I was offended and mad and I do consider me a feminist . but if that is how we treat the women or people who don’t understand it hurts and not helps. She should remember that everyone is different and when we attack those that think differently than us and are rude we just make ourselves look dumber and stupid and ignorant and push them further away from understanding us and the real truth. That’s absolutely amazing, I’m so happy to hear from a feminist on this issue! I agree, if you want more women to understand what feminist really means and to identify as feminists, attacking them is certainly not the way to go!